So. Got a question for you. Which do you prefer? Sir Arthur’s novels, or his short stories? The four Sherlock Holmes novels–namely, A Study in Scarlet, The Sign of [the] Four, The Hound of the Baskervilles, and The Valley of Fear– have some wonderful moments and great dialogue; I am particularly partial to Holmes’ and Watson’s meeting in STUD. 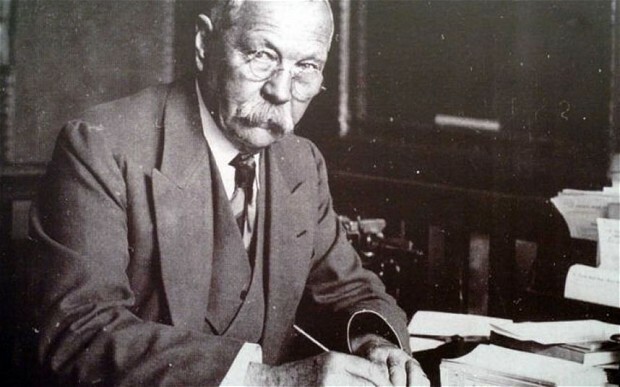 However, I have to say that I am not overly fond of Conan Doyle’s technique of starting a story quickly, then dragging it back with a lengthy flashback in the middle of the book. In my opinion, his talents were better-suited to the short story format. * Other authors find it difficult to “think short” and do better when they have more time and space to explore their characters and slowly spin out the plot. It’s relatively rare, I think, to find a writer who can pull off both forms equally well. ** Dan Andriacco achieves this feat in his latest Cody-McCabe release, Rogues Gallery. Up until now, I have only reviewed Andriacco’s Cody-McCabe novels. Rogues Gallery is a collection of two short stories and three novellas, all featuring the (as-yet) unpublished mystery writer, Jefferson Cody and his larger-than-life Sherlockian brother-in-law, Professor Sebastian McCabe. Once again the whole gang is here, from police chief Oscar Hummel (now courting Cody’s PA, Annaliese Pokorny) to Cody’s new bride, former reporter (now editorial director) Lynda Teal. This is a good thing, too, as Erin, a small Ohio college town with an unusually high per capita murder rate, is about to get a lot bloodier. First up is “Art in the Blood,” a novella which takes its title from Sherlock Holmes’ declaration to Watson that “art in the blood is liable to take the strangest forms.”*** As a college town, Erin has a small community of artists, including Cody’s sister (and Sebastian’s wife) Kate, a children’s book illustrator who has taken to working in stained glass. The Cody-McCabe clan is attending her first exhibit, part of a larger women’s art show at the Looney Ladies’ Gallery. The rest of the town also seems to be up for and evening of art, wine, and cheese platters, making for a long list of potential suspects when one attendee turns up with a corkscrew in his eye. Dr. Thurston Calder won’t be St. Benignus’ new art department head now, but was he dispatched by the competition, or someone else? Jeff and Lynda rush from that adventure headlong into another (“The Revengers”) when, on the way to a Halloween party (for which they are dressed as The Avengers), they stop to help a mysterious figure in scrubs, waving frantically at them from the roadside. 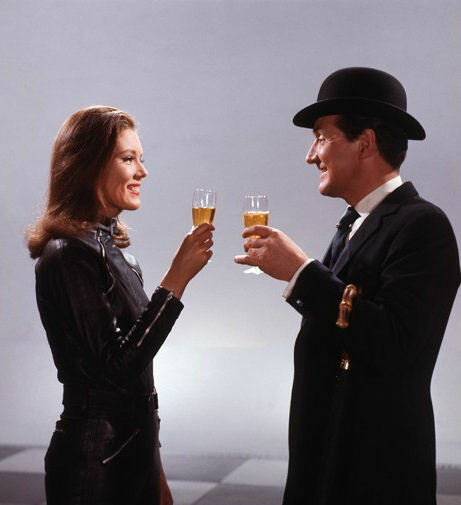 Whoever it is apparently hasn’t heard of the Hippocratic Oath, however, because within minutes, Steed and Mrs. Peel find themselves bound on the floor of an empty house, staring at a timer set to tick away the last twenty minutes of their lives. Will they get out alive, or will the rest of their stories turn out to be past escapades, à la The Hound of the Baskervilles? Whichever it is, I won’t tell you. Won’t tell you who set the bomb, either. The same cannot be said of “A Cold Case,” however, and this time, it’s not an outsider who adds to the body count. No, Erin’s population drops by one when Jeff and Lynda, excited house hunters, open a chest-style freezer to find, not pre-made lasagnas, but a realtor. Apparently bludgeoned to death with a frozen salmon, Olivia Wanamaker had a bad marriage, at least one lover, and a Twitter feud with Erin’s mayor. Did one of these lead to her death? Or was her killer actually St Benignus’ unpopular provost, Ralph Pendergast? Finally, what began with a Holmes quote, ends with a Holmes quote. 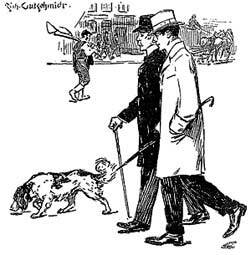 “Dogs don’t make mistakes,” Holmes told Watson in “The Adventure of Shoscombe Old Place.” People do, however, and in the collection’s final story, Cody finds himself coming to the defense of fellow aspiring mystery writer Ashley Crutcher, who claims she shot and killed her estranged husband by accident, having mistaken him for an intruder. It sounds like yet another episode of “Snapped”–until a jewel theft is thrown into the mix. Only Ranger knows what really happened, but unfortunately, he can’t talk. One of the enjoyable things about following a series is seeing how both the characters–and their author–develop. When I first began reviewing Mr. Andriacco’s books, I found them creative and enjoyable, but there were occasional passages which read “rough” to me, or abrupt insertions that, while they illuminated the characters, interrupted the general flow of the story. Those have vanished, and these stories go down as smoothly as Lynda’s favorite bourbon.† Although there are some dark and eerie moments–the gory corkscrew to the eye and a masked-and-gowned figure waving in the dark, for example–Jeff Cody’s conversational and unwittingly revealing narrative style keep the overall tone light, giving the book more of a “cozy” feeling, rather than that of an excursion into the darker sides of human nature. All of the regulars make an appearance, and it’s as nice to see some of the minor characters (such as Hummel and Pokorny) experiences some changes in their lives as it is to watch the still-besotted newlyweds. One of the drawbacks to having such a close-knit cast is that it is more difficult to play hide-the-murderer. Andriacco does his best to provide a long list of potential suspects amd motives, however, so I was only able to solve one case with certainty before the denouement. Whether long or short, each story was well-plotted and read quickly. If I found “Santa Crime” a teensy bit saccharine, it could be put down to the fact that I tend to fall on the Scroogish side of the holiday spirit spectrum. A long-time Sherlockian and member of a number of Sherlockian societies, Mr. Andriacco inserts enough canonical references throughout the book to entertain the knowledgeable reader without confusing the novice. He also provides enough background to keep Rogues Gallery a stand-alone work; one can jump right in without having read its predecessors. I would definitely recommend it to fans of the modern cozy. Now, if only poor Jeff could get a book deal. Rogues Gallery is available at some bricks-and-mortar stores, but is best obtained from your favorite online bookseller (Amazon, Barnes and Noble, Books-a-Million) or directly from the MX site (www.mxpublishing.com, or http://www.mxpublishing.co.uk). As of this writing, it is not available as an ebook, but that should change. You can learn more about Dan Andriacco, his writing, and other Sherlockian tidbits at his website, bakerstreetbeat.blogspot.com. *I say this not having read his other novels–although I have read a lot of his horror shorts, his true crime articles, his autobiographical works and his spiritualist writing. At some point, I need to venture into his historical novels, the Lost World and its related works. So–have you read any of ACD’s other novels, and if so, how do you think they compare to his Holmesian books? **Of course, perhaps everyone else can, and I just blab too much. There is that. †Or so I have been told. I can’t say for certain, as nothing alcoholic has ever gone down smoothly for me. 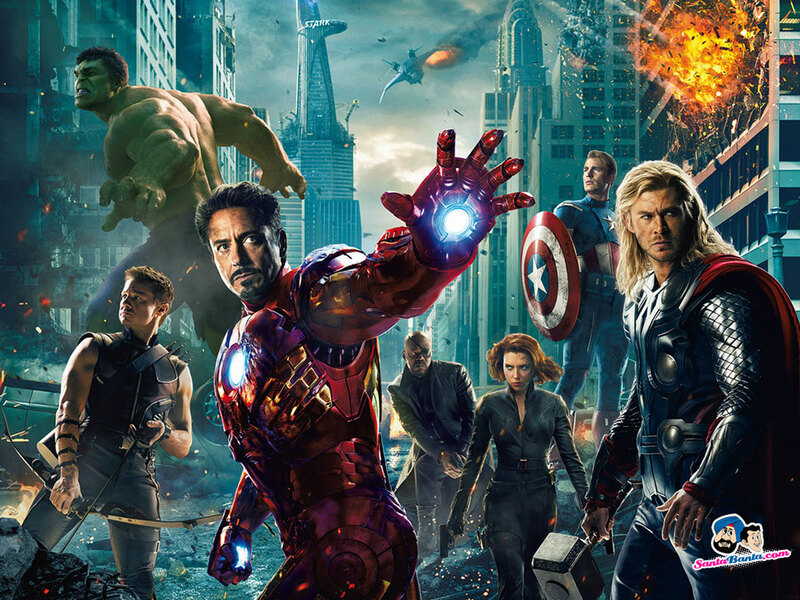 In the interests of full disclosure, I will say that I read “The Revengers” in draft form. However, as I was working on A Curious Collection of Dates at the time, my brain was total mush, and I do not believe I offered comments of any real value. In fact, by the time I began reviewing the book, I had forgotten who the actual culprit was. I enjoyed reading your review, Leah. I’ve read every Dan Andriacco mystery and am always waiting for the next! I’ve read his historical novels, The White Company, Sir Nigel, The Refugees, Micah Clarke, as well as The Lost World and Duet, and enjoyed all of them. I also really love The Valley of Fear, including the flashback story. The Brigadier Gerard short stories are also quite good. I have to admit, I found VALL really confusing until I learned more about the Molly Maguires. Once I had that background, I read it again (several times) and got a lot more out of it. Now VALL may be my favorite of the novels taken as a whole.